ESI on-site inspection services utilize our well-trained officers and innovative technology to provide you peace of mind. While the officer is on property, they will conduct continuous foot patrols or utilize on of our highly visible marked patrol vehicles. The officers will check in with our full service dispatch center hourly, reporting activity on your site as well as utilizing our DEGGY electronic tracking system. 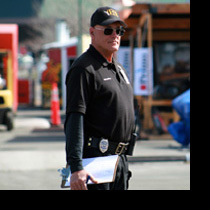 Your on-site officer will be trained in specialized courses both in the classroom and on the job to ensure your satisfaction and to meet the standards and qualifications for protective security in Nevada. Your officer will recognize and react quickly to security issues on your property. On-site officers are in constant radio communication with our dispatch center and tracked using our Networkfleet GPS technology. The DEGGY electronic tracking system ensures that each area has been checked and allows the information to be transmitted to our dispatch center. The Networkfleet GPS technology monitors the officers movements and rate of speed while they are driving ESI patrol vehicles. All data and information taken by our dispatch center is relayed to the designated contact for your property in a daily report giving an account of where the officer has inspected and what is happening regarding activity on the property.